#Office365Challenge In a library with 1000’s of documents, the ability to pin important documents or folders to the top is invaluable. 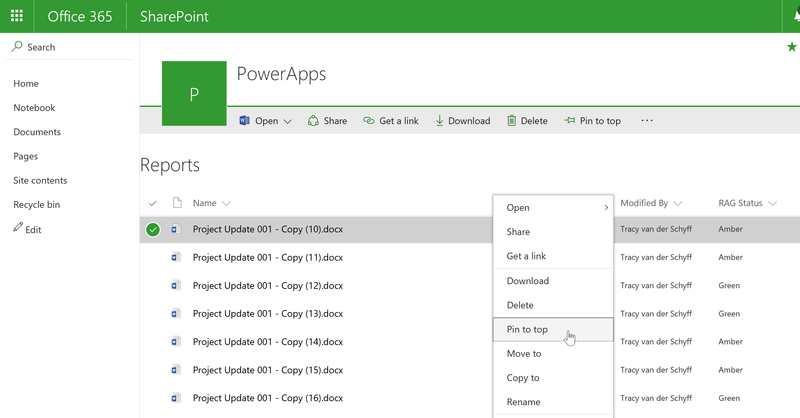 In the new modern libraries in Office 365, we have the ability to pin folders and documents to the top of the library. Why would you use this? If you want to put focus on a specific folder / document. Click on the ellipses next to the document of folder, click on Pin to top. Just another small thing that makes a big difference! Is this possible to do in Sharepoint 2013? I don’t have access to the Online version (company restrictions– Didn’t even know there was one!) But it would be so helpful! Hi Melanie. So it’s only available in Office365 and SharePoint 2016. However there is a bit of a work around. Add a yes/no tick box column to your library. Default always no. Change the documents you want to appear at top to yes. Change your default view to sort by that column then by document name. Might have to sort the yes/no descending – not sure, just check that all equal to yes shows at top. Thank you! That’s a good idea. That just made me think that I could also add a yes/no column and use a “group by” viewing structure. Pinned and General or something like that. (And word press signed me in or something here so that’s why my comments are in twice. Sigh.) Btw your blog is making my job sooo much easier. We don’t have access to Sharepoint designer so I’m making an image with hotlinks page right now! 🙂 with your help! You are so welcome. And you can ask me anything anytime. Is this possible to do in Sharepoint 2013 (application)? It would be very useful but company restrictions mean I don’t have access to the online version. So the pinned files on the top sometimes show the preview of the file, but the pinned folder is just gray back ground. I was wondering if there’s a way to add an icon to the pinned folder? Just to make the SharePoint look better versus a gray-ish default. IS it possible to change the default column display on the pin to top documents? I would like to use another column instead. Hmmm. I’m actually not sure. I know that shows in the site usage report in Site contents. Worth investigating.